Every child about to enter middle school will be able to relate to this heart-warming, funny story. Anthony Pantaloni needs to figure out one thing he does well--one thing that will replace the Antsy Pants nickname he got tagged with on the first day of fifth grade, one good thing he can "own" before moving up to middle school next year. It seems that every kid at Carpenter Elementary has a claim to fame: Marcus is Mr. Athletic, Alexis is Smart Aleck, Bethany has her horse obsession, and even Cory is known as the toughest kid in the school. Ant tries lots of things, but nothing sticks It doesn't help that there are obstacles along the way--a baton-twirling teacher, an annoying cousin, and Dad's new girlfriend, to name a few. 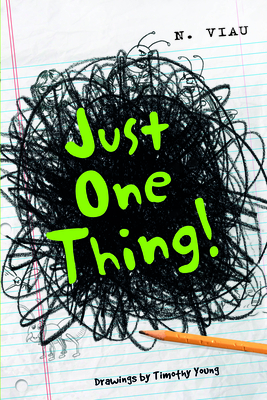 Just One Thing is chock full of hilarious adventures that will keep young readers cheering until the very end. For ages 8-12. Nancy Viau is the author of several picture books and a middle grade novel, Samantha Hansen Has Rocks in Her Head. Timothy Young is the author/illustrator of six picture books including I Hate Picture Books! and The Angry Little Puffin.